The notes I use are in the tab and the diagram - the note at fret 12 on the top string I have put in brackets because you have to alter your hand position slightly to get this note. I can get the same note (E) by bending the 2nd string 15th fret and getting the next scale note with my little finger at the top string 15th fret. By doing this I can keep the same hand position throughout. 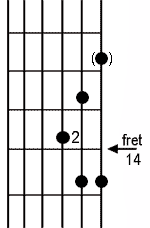 For the same reason (to keep the same hand position) in this position I tend to bend the C note at fret 13 up a semitone to C# rather than sliding up a fret to get a slurred effect as used in other positions.